When visiting Put-in-Bay, golf carts, bicycles and mopeds are the primary method of transportation. PutinBayOnline recommends Delaware Carts for all your golf cart and bicycle needs. We have convenient locations in downtown Put-in-Bay and also at the front desks of the Put-in-Bay Resort and the Bay Lodging Resort. 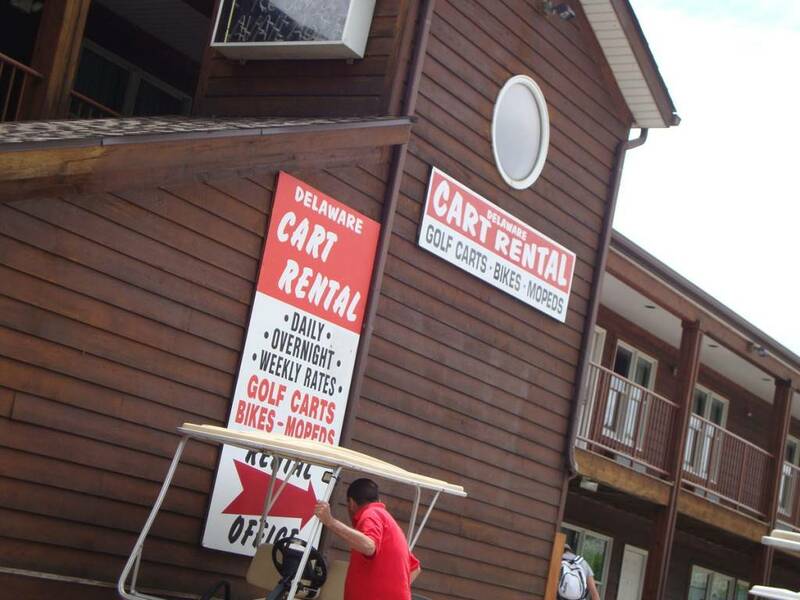 Delaware Carts features four, six and eight passenger golf carts for rent. Rentals are available hourly, daily, overnight or weekly. All of Delaware Carts’ rentals are gas powered. Also, they are high quality Club Car golf carts. Gas powered carts run for days. So, they are much more dependable than electric powered carts. These carts can last for merely hours. Gas powered carts run at a consistent speed all day. Moreover, they do not slow down as electric carts do as the day progresses. Delaware Carts is also Put-in-Bay’s only full time overnight cart rental. The main rental facility is conveniently located in the heart of downtown Put-in-Bay. The location is next door to Mr. Ed’s Bar & Grille. Also, the location is just a block from the Jet Express dock. Otherwise, a short 5 minute cab ride from the ferry. Rates are below. Reservations are wise and are available by CLICKING HERE. All golf carts from Delaware Carts are licensed and street legal. They all include proper safety equipment including headlights, taillights, turn signals, roofs and seatbelts. Golf cart and moped operators should also yield to any larger traffic. Carts don’t move that fast and can bottleneck traffic. Examples include the downtown bus or taxis. They are necessary to move people to and from the ferry services. If you decide to stop and sight see, be sure stop your cart or moped. Next, move as close to the right shoulder as possible. This will let larger traffic pass. Then, continue on your way. Golf carts and mopeds are licensed vehicles on Put-in-Bay Island. Therefore, they are operated under the same set of laws as any other motor vehicle (automobile) in the State of Ohio. This means you must possess a valid driver’s license and proof of insurance. Please do not let anyone operate your golf cart or moped unless they are a licensed driver. Stay seated at all times until the golf cart comes to a complete stop. Also, keep your seat belt fastened. Be considerate of island property owners. So, do not drive thru yards or on private roadways.